Sunday April 14 1907 I fixed coops and put my little chickens out in the lot in the morning. That with the dinner kept me busy till noon. Billy was home for dinner and had a little girlfriend with him. I rested on the bed most of the afternoon then got up and wrote some. It was a bright quiet day though cool. 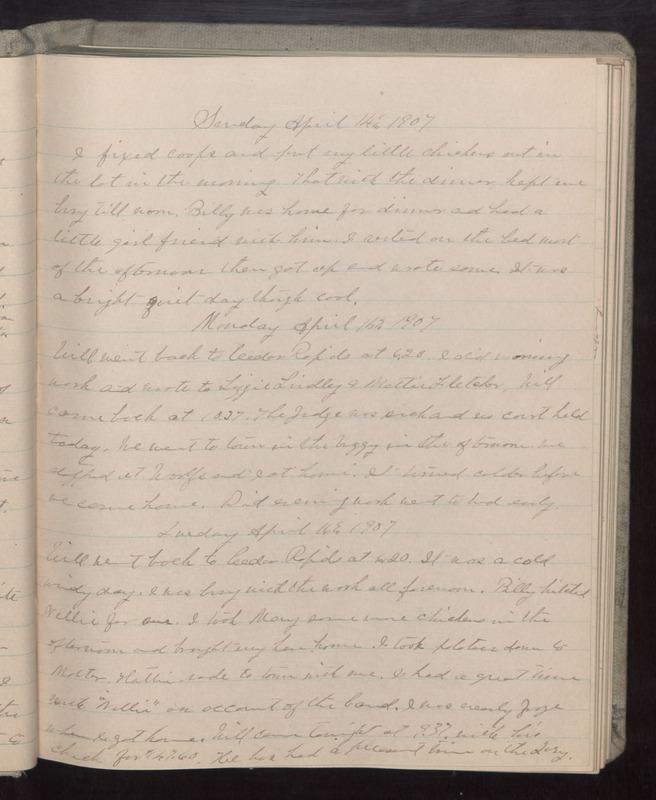 Monday April 15 1907 Will went back to Cedar Rapids at 6.20. I did morning work and wrote to Lizzie Lindley & Mattie Fletcher. Will came back at 10.37. The Judge was sick and no court held today. We went to town in the buggy in the afternoon. We stopped at Woolfs and I at home. It turned colder before we came home. Did evening work went to bed early. Tuesday April 16 1907 Will went back to Cedar Rapids at 6.20. It was a cold windy day. I was busy with the work all afternoon. Billy hitched Nellie for me. I took Mary some more chickens in the afternoon and brought my hen home. I took potatoes down to Mother. Hattie rode to town with me. I had a great time with "Nellie" on account of the band. I was nearly froze when I got home. Will came tonight at 9.37 with his check for $147.60. He has had a pleasant time on the Jury.